We introduced this design a couple of years ago and it is a constant best seller at a very competitive price! 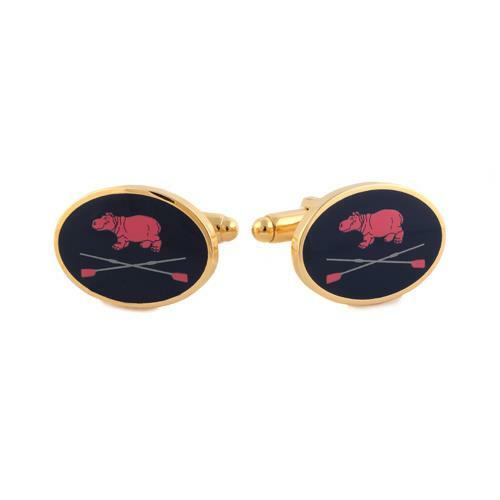 Dark blue enamel cufflinks with the distinctive pink hippo and oars Leader logo. It goes well with the navy blue club blazer. 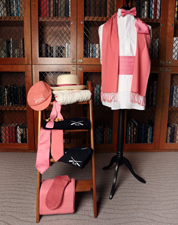 They are appropriate both in the office and at the Henley Royal Regatta. 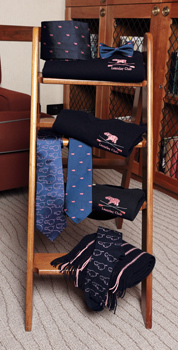 They pair excellently with the Leander members silk tie and panama hat. It has a torpedo fitting with gold metal finish. It comes with a navy blue gift box which has the club logo printed in gold on the inside of the box. Like the majority of our cufflinks, it is available to members and non-members alike. Do have a look at the range of cufflinks as we offer quite a few different designs which are regularly being added to. If you have a design or idea for a new one, don't hesitate to contact the shop!